The Taché Promenade project will improve public spaces and the riverfront area along Taché Avenue between Provencher Boulevard and Despins Street. The project will feature a widened promenade-style walkway and pedestrian belvedere, commonly known as a lookout, elevated above the riverbank that incorporates public art. Together, these features will build on the success of our core waterfront areas, improve connections to St. Boniface destinations and enhancing pedestrian and cycling opportunities. The project also involves riverbank stabilization work, which will protect the promenade, roadway and important sewer and water infrastructure in the area, and also increase the reliability of the City's primary dike. Riverbank stabilization work will take place over the winter of 2017-2018, and construction of the promenade and pedestrian belvedere features will begin in 2018. The Taché Promenade project is now substantially complete. Riverbank stabilization and erosion protections works were completed in an earlier phase of the project and will provide long term protection of the riverbank and public infrastructure. With the second phase of the project now complete, the southbound lane of Tache has been re-opened to traffic, and all sidewalks including the Belvedere lookout structure are open to the public. The Winnipeg Arts Council recently installed a new public artwork on the project called PHARE OUEST (FAR WEST) by Winnipeg artist Marcel Gosselin. The artwork is located on the Belvedere structure where there is a widened seating area that overlooks the river. Final landscaping and riverbank naturalization will occur in the spring of 2019 when weather conditions and river levels permit. A grand opening of the entire project will occur in the spring of 2019. The second and final phase of construction of the Taché Promenade project will begin on May 28, 2018, and is expected to be complete in October 2018. During this time, construction will continue on sidewalk widening, the Belvedere lookout structure, a public art feature, and landscaping. Throughout the summer, the southbound lane of Taché Avenue and the west sidewalk will be closed between Provencher Blvd. and Despins Street. Additionally, a full closure of Taché Avenue in both directions between Avenue de la Cathédrale and Despins Street will be required for crane work starting on May 28, 2018, until early July, 2018. Pedestrian access will be maintained on the east sidewalk. Additional details related to construction activities can be viewed in the notice of construction. Phase 1 of this project has been completed. Winter construction work consisting of riverbank stabilization and erosion protection have been completed on schedule, prior to elevated spring river levels. The lane closure on southbound Taché Avenue that was required to accommodate this work will be re-opened to traffic on March 18, 2018. Phase 2 construction (includes sidewalk widening, retaining wall installation, and construction of the belvedere pedestrian structure) is expected to commence in June 2018. The exact date will depend on site conditions and river levels. Note that additional lane closures on Taché Avenue are planned during Phase 2 of construction. The southbound lane of Taché Avenue will again require closure for a significant portion of the summer construction season to accommodate the work. Additionally, a full closure of Taché Avenue (both directions) will occur for a period of approximately 4 weeks in early summer. Details of these closures and advance notices to local residents and business will be communicated at that time. Phase 2 is scheduled to be complete in October 2018. Council approved funding for this project on September 27, 2017. A construction contract has been awarded to Maple Leaf Construction Ltd. to complete the proposed works. Riverbank stabilization work will begin in early December, 2017 and is expected to be complete by mid-March, 2018. During this period, the southbound lane of Avenue Taché and the west sidewalk will be closed between approximately Provencher Blvd. and Rue Despins. Additional road closures are planned during the remaining construction works to be completed in the summer of 2018, including sidewalk widening, retaining wall installation, and construction of the belvedere pedestrian structure (tree top lookout). Additional details related to construction activities can be viewed in the notice of construction. Construction updates will be communicated to area residents and businesses as the project progresses. A public engagement summary and report are available under the documents tab of this website. Thank you to everyone who joined us at a public information session on October 17, 2017. There were over 60 people in attendance and 27 exit surveys collected. An online survey was available until October 31, 2017 and collected 44 completed submissions. With the construction substantially complete, Public Engagement on this project has now concluded. Taché Avenue is a regional street that forms a portion of the City’s primary diking system to defend against flooding along the Red River. The section of Taché Avenue between the Esplanade Riel pedestrian bridge (Provencher Boulevard.) to Despins Street is along the outside bend on the east bank of the Red River and has a history of riverbank instabilities. Multiple stabilization and erosion protection projects have been undertaken over the years, although some portions remain unprotected. Continuing instabilities pose an unacceptable risk to the road, dike, sewers and other infrastructure on the top of the riverbank and require improvements. In 2014, a 20-year downtown waterfront vision was developed for several waterfront areas of the City of Winnipeg, including St. Boniface and the Forks. The Taché Promenade Conceptual Plan is part of this vision as identified in the 2014 Go To the Waterfront document. In 2015, the City commissioned a riverbank condition assessment and a functional design for the sidewalk expansion and the lookout structure. View the findings and recommendations. On March 7, 2016, the Standing Policy Committee on Protection, Community Services and Parks, recommended a three phase capital funding approach in the 2016 Capital Budget for riverbank stabilization, tree top lookout and public art for the Taché Promenade. A working group of key stakeholders have been meeting for several years to advance the vision of a walking/cycling loop linking Winnipeg’s culturally important and historically significant destinations and organizations on both The Forks and St. Boniface sides of the Red River. These sites include, The Forks National Historic Site, the Canadian Museum for Human Rights, Esplanade Riel Bridge, Norwood Bridge, the Taché Docks, the St. Boniface Museum, the St. Boniface Cathedral, and the St. Boniface Hospital. Various project sponsors are developing portions of the loop. The role of the working group is to ensure coordination and collaboration between the various stakeholders in linking destinations, interpreting points of interest, and creating an enjoyable and memorable user experience. The belvedere is a 100 metre long walkway suspended in the river forest canopy off the Taché Promenade. It was envisioned to provide a unique perspective on the river landscape, and capture one of the most spectacular views in Winnipeg, framing the Canadian Museum for Human Rights, Esplanade Riel, The Forks, and the downtown skyline. It will be an improvement to the foregrounds of the St. Boniface Museum and cathedral, and is a key addition to the proposed St. Boniface/Forks Loop, which will link destinations on both sides of the river becoming a tourist attraction in itself. The project includes financial commitments from the Federal Government and The Winnipeg Foundation. Where the lookout/belvedere is closest to the river, there is a widened viewing area with seating and a location for a public art piece on the theme of 'Guiding Light.' This location and this theme take inspiration from an important historical moment when, with lantern in hand, Bishop Provencher greeted four members of the order of the Grey Nuns of Montreal in 1844. The art piece will interpret this theme liberally, and take inspiration from nearby organizations and attractions along the St. Boniface/Forks Loop like the St. Boniface Cathedral, the St. Boniface Hospital, the Canadian Museum for Human Rights, the planned Walk of Reconciliation at The Forks, Oodena, - all of which touch on different dimensions of the ideas of guidance and light: coming together, spirituality, refuge and solace. The exact location and sculptural form of public art will be determined as the detailed design phase progresses. The Winnipeg Arts Council will be supporting the art commission process, funding and implementation of this portion of the project. Will construction winter lane closure affect access to the main entrance approach to 500 Taché? During this period, southbound traffic will be closed on Taché. Northbound traffic will still have access to the main entrance approach to 500 Taché. What other closures are planned for future phases of the project? The southbound lane may be closed again between June 15 and October 30, and a full closure of Taché will occur in the summer for approximately one month. During both of these closures, the contractor must maintain vehicular access to the main entrance approach to 500 Taché. Will emergency vehicle access be affected by the lane or road closures? The Contractor is required to accommodate emergency vehicle access through the site and to 500 Taché at all times. Will the east sidewalk remain open during construction? Yes. Closure of the west sidewalk is planned throughout the project, but the east sidewalk will remain open. 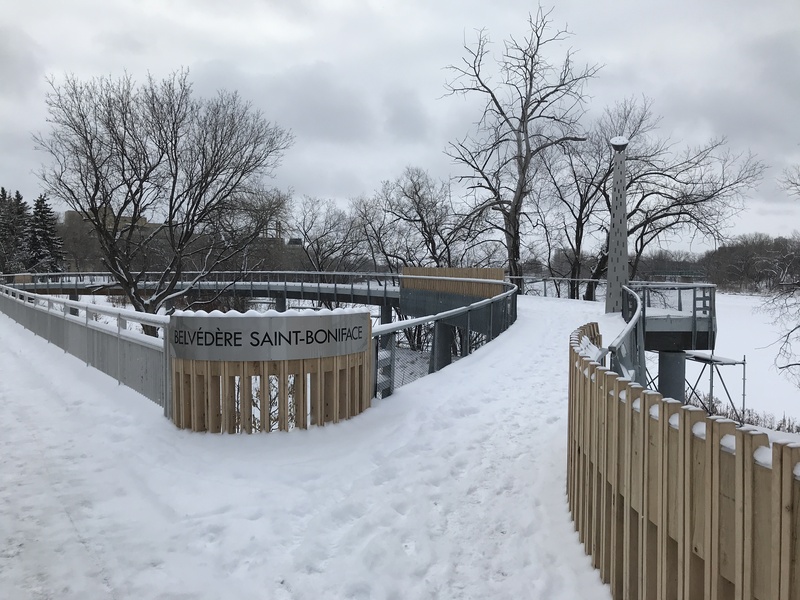 This project will improve public spaces and the riverfront area along Taché Avenue between Provencher Boulevard and Despins Street featuring a widened promenade-style walkway that incorporates public art and a pedestrian belvedere elevated above the riverbank. Together, these features will build on the success of our core waterfront areas, improve connections with destinations in St. Boniface and enhance pedestrian and cycling opportunities. The project also involves riverbank stabilization work, which will protect the promenade and important sewer and water infrastructure in the area and increase the reliability of the City’s primary dike. How is this project funded and how much will it cost? The project is estimated to cost $10 million, which includes a $1 million contribution from the Winnipeg Foundation, and a Canada 150 grant from the Federal Government in the amount of $500,000. Why will this project cost $10 million when the budget was $5.2 million? As the design progressed the budget for this project was refined from a class 4 estimate (accurate within –30% to +60%) to a class 2 estimate (accurate within –10% to +20%). As well, the project scope was increased to include an additional 140 metres of high priority riverbank stabilization work immediately north of the initial project site to ensure long term stability of the riverbank and primary dike. Funding for the additional riverbank stabilization work will be provided through the Riverbank Stabilization program. Riverbank stabilization work will take place over the winter of 2017-2018, and construction of the promenade and pedestrian belvedere will continue into 2018. Will traffic be impacted during construction? To complete the work as efficiently as possible, lane closures on Taché Avenue will be required, and at times, a full closure of Taché Avenue is needed. During these closures, advance detour signage will be provided. The duration of these impacts will be minimized as much as possible. What's the plan for walking and cycling during construction? The sidewalk on the west side of Taché Avenue will be closed during construction. Pedestrians and cyclists may use the east sidewalk during this time. A belvedere is an architectural structure sited to take advantage of a fine or scenic view. For this project, an elevated walkway approximately 100 metres long will be constructed out over the riverbank, situated within the riverbank forest canopy. It is intended to take advantage of stunning views of the Forks and Downtown across the river, and will feature a public art installation. Please see example in above image. Will the lookout/belvedere structure be universally accessible? Yes, the structure will be accessible to people of all abilities. It has been designed in accordance with City of Winnipeg Accessibility Design Standards. The belvedere is a curving and elevated structure that projects over the sloping riverbank, extending almost to the water’s edge. There are no stairs or steep ramps on the belvedere; However, because it extends out over the sloping riverbank, it will provide users with an elevated experience, up in the middle canopy of the riverbank forest. It will be connected on both ends to the improved and widened promenade west sidewalk along Taché Avenue. Will riverbank trees be removed for stabilization work or lookout construction? Will new trees be planted? In order to gain access to the riverbank and carry out stabilization work, some trees will require removal. The layout of the bank works has been carefully selected to minimize the impact on mature riverbank trees. To offset the loss of trees, new plantings will be installed as part of overall landscaping and vegetation restoration strategy. Will the project feature a public art piece? Yes, plans are currently underway for the incorporation of a public art piece to be located on the belvedere. The Winnipeg Arts Council has been involved in the process and securing an artist for the work. The images you currently see on the website and public information session boards include a placeholder for the art piece only. Additional details of the art installation will be available at a future date.